I can't see it or find it but is there a "General" category for discussions. The only main ones I see relate to Shopping. 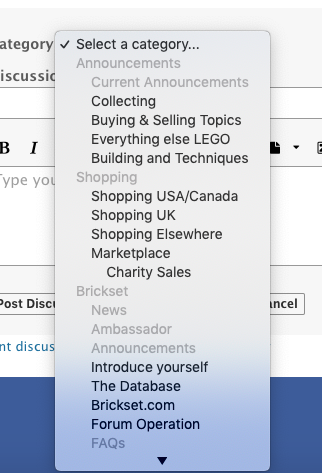 Where would I post if I wanted to start a discussion about a certain Lego piece that has nothing to do with buying/selling. I think I found the problem. A bug in the categorization. See the pic. "Collecting" should be outdented and not under "Announcements".